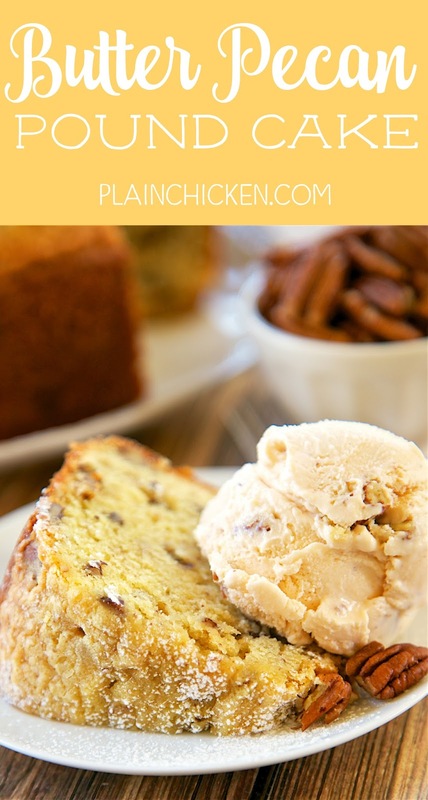 Butter Pecan Pound Cake - one of the AMAZING pound cakes I've ever eaten! So easy and delicious! Flour, vanilla pudding, butter, pecans, eggs, sour cream and Vanilla, Butter and Nut extract. Only takes a minute to make and it smells amazing while it bakes! I took this to a party and everyone asked for the recipe! This Butter Pecan Pound Cake was SO delicious! I am not usually a fan of Butter Pecan, but this cake won me over!! It is so buttery, moist and full of amazing pecans! 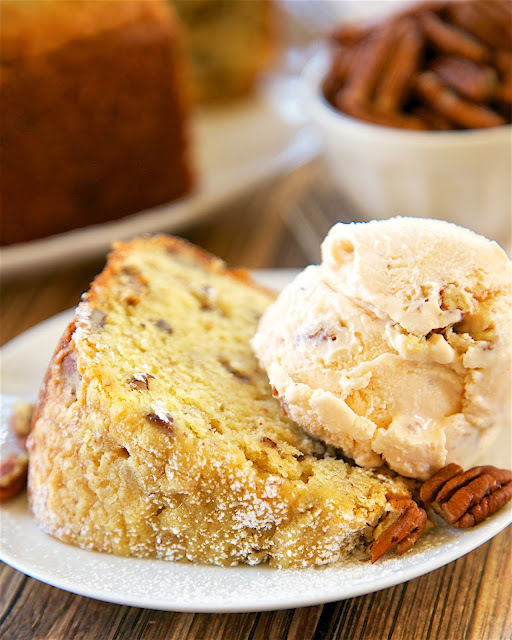 To put the cake over the top, we served it with some Butter Pecan Ice Cream - heaven! The flavoring in the cake comes from the Vanilla, Butter & Nut flavoring. This was my first time baking with the Vanilla, Butter & Nut flavoring. It is made by McCormick - you can see it here: http://amzn.to/29SBrSf. It really made the cake. Note - I used a tube pan to bake this cake. You can find it here: http://amzn.to/29Md0Cn. I've been baking most of my pound cakes in this pan lately. They never stick and there is plenty of room for the cake to rise. If you don't have a tube pan and decide to bake this in a bundt pan, make sure to leave about an inch of the pan unfilled. If you fill it all the way to the top, the cake will spill out all over the oven and make a huge mess. You might have leftover batter if you use a bundt pan, but at least you won't have a big mess in the oven. Sift together the flour, vanilla pudding mix, salt and baking soda. Set aside. Cream together butter, sugar and Vanilla, Butter &amp; Nut flavor. Beat for 2 to 3 minutes, or until light and pale yellow in color. Add the eggs, one at a time, beating well after each addition, stopping and scraping the sides of the bowl as needed. Reduce the speed of the mixer and add the sifted dry ingredients alternately with the sour cream. Mix until fully combined. Stir in the chopped pecans by hand. Can this be made i a bundt pan? I do have a tube pan with a removable bottom/center. Is this what you used? Although I'm not Stephanie (LOL! ), I have made this cake in a Bundt pan. I always spray the pan with Baker's Joy spray (it has flour and cooking spray in it). It always comes out great for me. By the way, THIS is a really great cake!!! Thanks Stephanie! I bought the pan you suggested and made this cake last night. Wow is this a delicious cake! I brought it to work and have received numerous compliments. Thanks Stephanie for another great recipe. Would this make 2 bread loaves? And if so what temp and how long would you recommend cooking them this way? This and all of your pound cakes look and sound amazing!! I would like to make a pound cake and mail/ship it to my adult niece who lives in SC (I live in Georgia). I have never mailed a cake; but thought a pound cake would travel better than a layer cake. 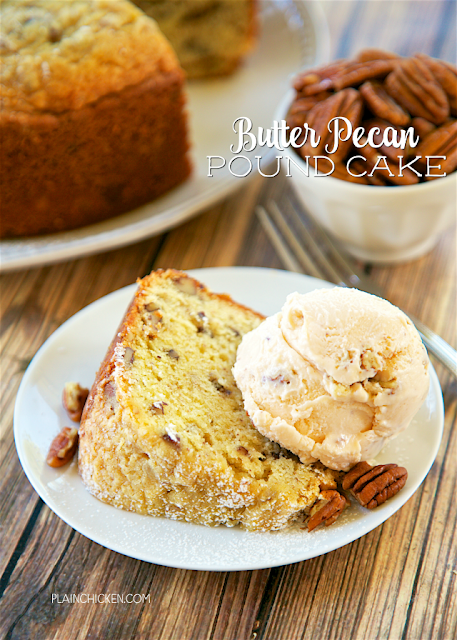 Do you think this cake -your Butter Pecan Pound Cake would hold together well in the mail? Or do you think a pound cake without nuts (such as the Pound Cake from Heaven or a Lemon Pound Cake) would arrive in good shape? Also Steph, can you advise me the best way to mail/ship the pound cake so that it will arrive in good shape?